We spent the past weekend in Yosemite National Park, and the visit brought me back to when we first moved to California 12 years ago. One of the first things I noticed was how cold it was in the shade, even on a warm summer day. In Texas, where I grew up, it’s just hot in the summer. It’s hot in the sun, and it’s hot in the shade. But in California, even when it’s incredibly pleasant in the sun, it’s freezing in the shade. Not just cooler, but legitimately cold. 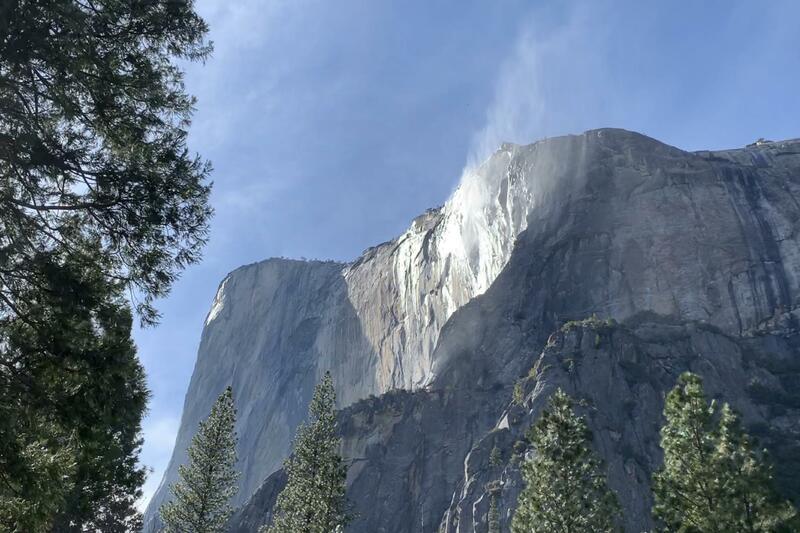 What brought me back to this early realization while walking around Yosemite was, every once in a while, I’d notice I was physically shivering, completely unnecessarily. It was in the mid-70’s according to the weather report, but I found myself caught off-guard by a chill. The reason why: I had wandered into the shade. There was sunlight all around, but I had inadvertently stopped in a shadowy spot. Luckily, all I had to do was move into the sun to warm up. The experience reminded me of something I’ve noticed many, many times in my Christian life. God’s love is like pure, radiant light shining down from heaven, and anyone who knows Him in truth can walk in that light. Even though sin brought a shadow over the whole earth, yet when Jesus died and rose again, He defeated sin and death. He did everything necessary to secure the unbroken light of God’s love in our lives. This passage might well describe every single day of my Christian life. But I’ve noticed that spiritually speaking, there are times that I have been caught off-guard by an unexpected chill — plagued by doubt, discouragement, self-condemnation, self-pity, etc. Like wandering into the shade in California, this change in “temperature” can occur quite suddenly. But it’s completely unnecessary! There is absolutely no reason to be spiritually “cold” — “He has granted to us everything pertaining to life and godliness” (2 Peter 1:3). Already. Done. It struck me that many times, when some unnecessary thing — some branch or cloud so to speak — is casting shade on my spiritual life, making me cold, it’s because I’ve wandered out of the sunlight. I have neglected my responsibility to keep myself in God’s love, as Jude exhorts us in his letter. If we expect there to be no branches and no clouds in our lives on earth, we are mistaken. As long as we live in this fallen world, shadows will fall across our paths, but the Christian is one who says, as the song goes, “I am resolved to let nothing between,” and refuses anything that dims the light of God’s love. Branches and clouds may come, but the Christian is one who will not “let” anything stay between. We have to keep ourselves in the love of God by forceful faith: whenever we notice we are chilled, we’ve got to get back into the sun! We have been taught that it is fitting to have an attitude of unworthiness. Two of the people whose faith impressed Jesus considered themselves unworthy (Matthew 8:10, 15:28)! So it’s definitely a precious thing to see that we aren’t worthy to come to the Lord. Yet I’ve noticed that a sense of my own unworthiness can often bring a spiritual chill like the ones described above. So what’s the difference? Those of “great faith” were commended because they came to Jesus despite their feelings of unworthiness — the knew they were unworthy, yet they still came to Jesus. I have seen a tendency in myself to become so convinced of my unworthiness that I stay away from Him. Anytime I am more aware of my deadness and sickness and sinfulness than I am His willingness to welcome me, those clouds come in and steal the light of God’s love. I can forget that He is a God Who calls into existence that which does not exist, and Who gives life to the dead (Romans 4:17). If I saw His willingness and His promise rightly, my deadness and unworthiness would not keep me from Him. In fact, I have discovered that “unworthiness” that does not come to Jesus is really unbelief. Hebrews 3:19 says that the Israelites “were not able to enter the promised land because of unbelief.” We will never enter the promised land of the overcoming life either, if we are not full of faith that God will always welcome back those who run to Him for help (Hebrews 4:16). The enemy wins so long as I stay away from the Lord, no matter the reason. Any way he can get me to stay away — even if it’s unbelief disguised as unworthiness — is a victory. If he can get me to lose my confidence in coming, great! Jesus paid such a price to secure the unbroken light of God’s love in our lives. I have understood that I take His sacrifice lightly if I sin flippantly, or don’t radically repent from all known sin. But I had never seen so clearly that I also take His sacrifice lightly when I refuse to receive what He paid so much to obtain for me — the light of God’s smile. To hold back in shame or discouragement, thinking that I’m unworthy to run to Him, is to insult the price He paid to bring me back to God. I don’t want to refuse what He has purchased for me with His blood! If you’re spiritually cold, come into the light of God’s love. If, like me, you have realized that you’ve picked up a chill at some point along the path, come back into the light of God’s love by faith.